Vantage is a bespoke cloud based platform, tailored to meet your needs as a contractor. Vantage gives you a real-time financial update, 24/7 from anywhere in the world. Listening to our contractors, Vantage was built to take away the pains and hang ups of not fully understanding where your finances are up to. As a Nixon Williams client, along side your Vantage access, you'll also benefit from an experienced dedicated accountant. Here to help guide you through the myriad of compliance, legislation and jargon you shouldn't need to handle on top of your day job. Get an instant real-time financial picture of your business which can be drilled down to the level of each transaction making up a balance. Your finances at your fingertips – at any time. With 24/7 access you can be anywhere in the world, as long as you have internet access. 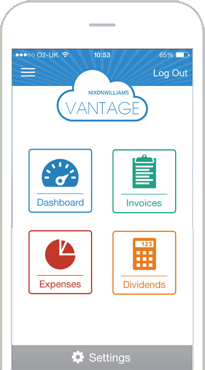 Jargon free with a clear intuitive layout, Vantage is designed to make even the most complicated of tasks simple. Inside or Outside of IR35? Irrespective of your status all tasks can be tailored to the assignment you're working on. Professional, traceable invoices created in a few clicks. Sat at a desk or waiting for the tube? Never let another invoice slip your mind. SSL encrypted with remote data backup ensures that your information remains completely safe at all times. All rights reserved. Nixon Williams Ltd is a company registered in England & Wales.